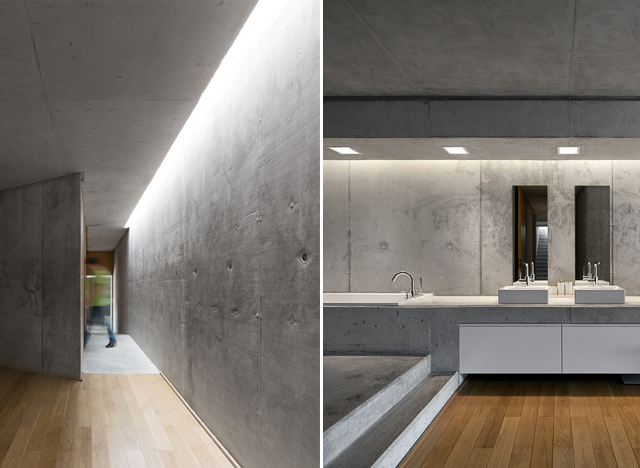 On a hillside rising high above a lagoon that flows into the Atlantic Ocean, the House in Rainha takes claim to two rectangular volumes constructed of concrete and glass. Brussels based architecture firm AABE designed the residence, which functions as the holiday home for a family who enjoys escaping the city for relaxing weekend getaways. 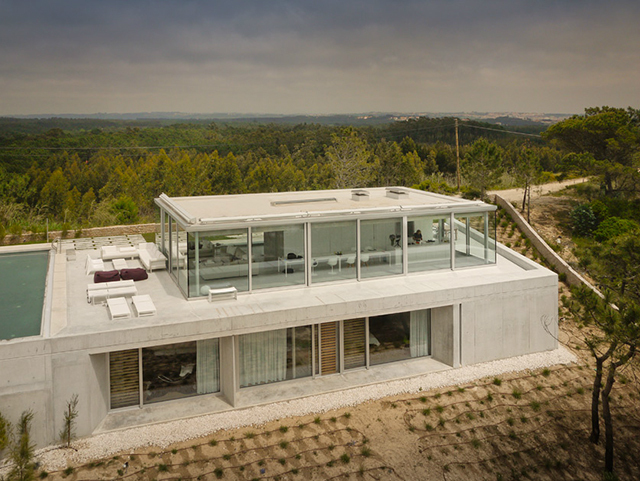 Theoretically, the two level home is separated into two sections; the 'day level' is constructed of glass and embraces 360 degree views, and the 'night level', is built of concrete, houses the sleeping quarters, and allows for more privacy. The two level home begins with an entirely concrete structure secured into the hillside. Vehap Shehi, project manager of the build explained that here, on the night level, "the family room is placed in the center of the floor. This family room “distributes” all the bedrooms, which are open directly to the garden." Because the entire first floor is covered in concrete, getting the right shade was integral. Shehi noted that various concrete colors and tones were tested directly on the site to ensure that the color properly suited the environment. On top of the concrete structure sits a smaller rectangular glass volume. This space houses the living room, dining room, kitchen, and a fireplace, which looks out onto an infinity pool. The pool descends into the rooftop of the concrete structure below, At night, the mirror formed by the water of the pool reflects an array of twinkling stars for the owners to admire.